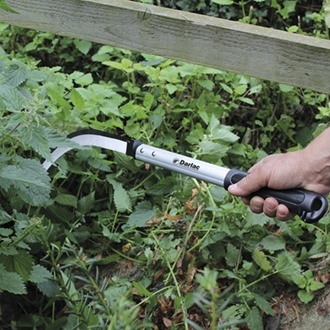 Darlac Sickle - Designed for clearing nettles, thistles, briars, undergrowth and vegetation. Features an aluminium handle with a solid rubber grip and a razor-sharp carbon steel blade which is resharpenable. Designed for clearing nettles, thistles, briars, undergrowth and vegetation. Features an aluminium handle with a solid rubber grip and a razor-sharp carbon steel blade which is resharpenable. Cut with a slicing rather than hacking action pulling back on the handle at the end of a swing. USE EXTREME CARE when working with sharp objects. Amateur Gardening Top Marks. Weight: 440g, Overall Length: 600mm.